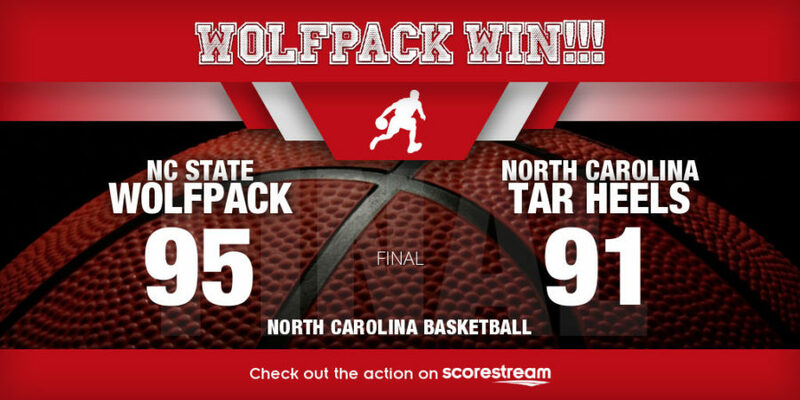 CHAPEL HILL, NC — North Carolina State bagged a massive road win on Saturday after they went to Chapel Hill and beat No. 10 North Carolina 95-91 in overtime at Dean E. Smith Center. Both teams end regulation locked at 83-83, while North Carolina led 41-38 at halftime. Markell Johnson knocked down a key 3-pointer early into overtime play and then made two important free throws in the final seconds to kill the game for N.C. State, which was winning at North Carolina for the first time since February 2015. Johnson ended with 20 points, 11 assists and five rebounds, while Allerik Freeman scored a career-high 29 points off the bench and made seven 3-pointers to go with five rebounds for the Wolfpack (15-7, 5-4 ACC), who connected on 15 3-pointers to setup the win. Torin Dorn also finished with 20 points and hit four 3-pointers, while Omer Yurtseven added 16 points and 13 rebounds for N.C. State, which won two straight and three of the last four overall. Luke Maye led North Carolina with 31 points, 12 rebounds and three blocks. Theo Pinson ended with a career-best 22 points and 15 rebounds, but Joel Berry II was held to just six points on 3 of 12 shooting for the Tar Heels (16-6, 5-4 ACC), who were suffering back-to-back defeats for the second time this season. The defending national champions were beaten by Virginia Tech earlier this week. UNC shot 53 percent from the floor, but made only 4 of 19 from 3-point range went 11 of 20 from the free throw line. Meanwhile, N.C. State, which was just 1-13 in Chapel Hill against Roy Williams before Saturday’s game, shot 45 percent. NC State will visit Notre Dame next Saturday. North Carolina will travel to No. 18 Clemson on Tuesday.